MMC's mission is to uplift and transform the work of coaches from all niches, all levels of expertise by providing them with the rare and exceptional education and inspiration that comes from hearing the role model, the Master in action. Hi, I'm Gail Moore of Moore Master Coaching. I'm a professional coach receiving my certification from the International Coach Academy. Fifteen years ago while volunteering for hospice in NYC, I had the good fortune to meet and spend time with Josie, a 28 year old woman with ALS/Lou Gherigs disease. I visited with her every week for a year and watched as Josie gradually lost everything. She moved through each phase of her transition with such courage and grace, feeling her fears, sorrow and pain at the same time relishing and delighting in each precious moment as if it were her last. She lived her life during that period more fully than anyone I have ever known before or since. No longer able to speak and so using a special machine to type by blinking her eyes, Josie expressed to me one afternoon her grief over not leaving anything of significance behind. I told her that she had profoundly touched and transformed my life as well as so many others by just being who she was. I explained that it was because of her that I had decided to dedicate the rest of my life to helping people through difficult transitions. I was blessed to be with Josie when she passed and 2 months later I began working for hospice with the patients and their family caregivers. Three years after that I got my coach certification and began my private practice. Initially I assisted the terminally ill through the death and dying process as well as anyone going through a challenging transition. I then became a caregiver myself for my mother through her extended illness. After falling hard into the pitfalls that many caregivers do (and I knew better! ), I felt a calling to specialize in coaching women care-givers. I really love and respect the coaching profession. I have seen amazing results with my clients as well as experiencing them myself while working with various coaches throughout the years. Coaching is a whole new paradigm for the new millennium, one based in the understanding of the inherent greatness that lies within each of us. Coaches from my experience are a conscientious, respectful, self aware group of people who are dedicated to helping their clients access that greatness and achieve their dreams. To support this firm intention they are continually looking to learn and grow both as a person and as a coach. All of the different training I have received over the years has been so beneficial and I'm very grateful. It did however become glaringly apparent to me as well as to many other coaches that something vitally important was missing. There has been little or no experience of the Master, the role model in action, thus leaving a gaping whole in the ongoing learning experience of the coach. Coaches have needed more than they have gotten and I am thrilled and excited to have found a way to fulfill that need in the marketplace! 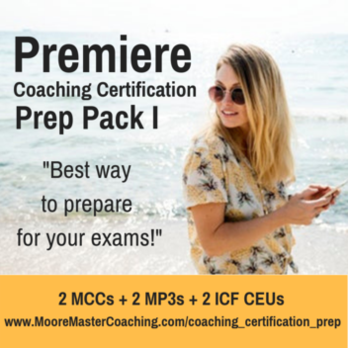 So welcome to Moore Master Coaching and the opportunity to make significant strides in your coaching skills as well as with your business practice. You will receive a level of growth and inspiration that is unparalleled and has been unavailable anywhere else until now!